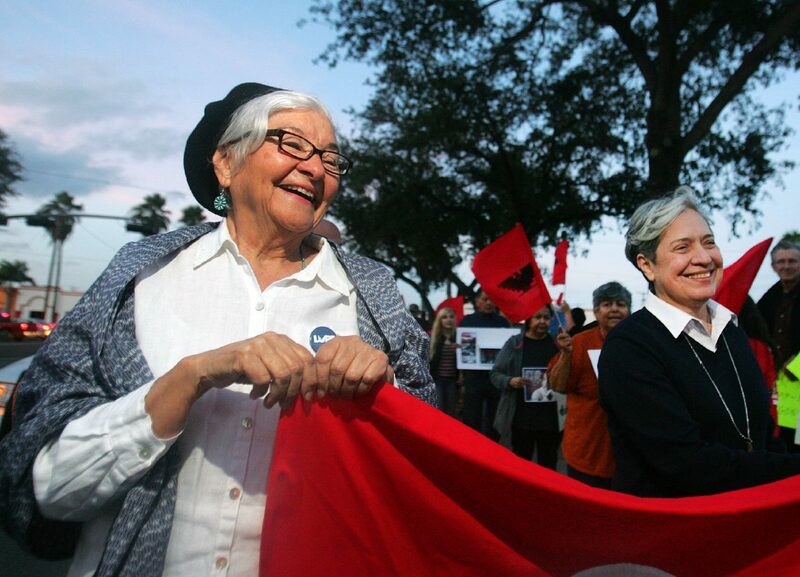 Civil rights activist Rebecca Flores, left, and Sister Norma Pimentel march down 17th Street during the eighth annual MLK Day celebration in downtown Monday, Jan. 15, 2018, in McAllen. McALLEN — As Sister Norma Pimentel’s profile continues to explode, and a day after receiving a national award halfway across the country, she surprisingly received a $27,000 donation from the Jewish community for her work assisting immigrants. Pimentel has become well-known for helping immigrant families, and under President Donald Trump, immigration along the United States-Mexico border has been a focus. Recently, with Trump’s “zero-tolerance” policy, some 2,500 immigrant families were separated. Hundreds of those families, upon reunion, have stayed temporarily with Catholic Charities of the Rio Grande Valley, which Pimentel directs. So the Hispanic Heritage Awards honored Pimentel with the organization’s community service award on Wednesday night in Washington. Local leaders lauded Pimentel on Thursday evening at NIU Living on 10th Street upon her return from the country’s capital, where Pimentel also announced a campaign to raise $5.5 million for the new, permanent humanitarian respite center in downtown McAllen. Those funds will go toward the building itself, and its operations. On Thursday, Blum presented Pimentel with a check for $27,350.